We've had a busy start to Fall. 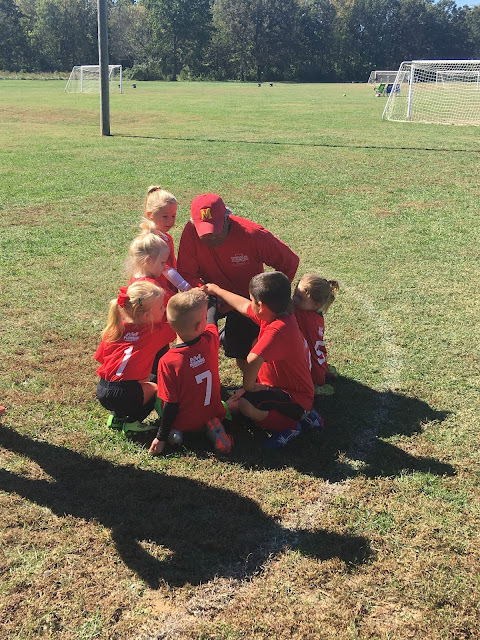 Weddings, birthdays, baby showers, school field trips, our first year of soccer - you know the drill. 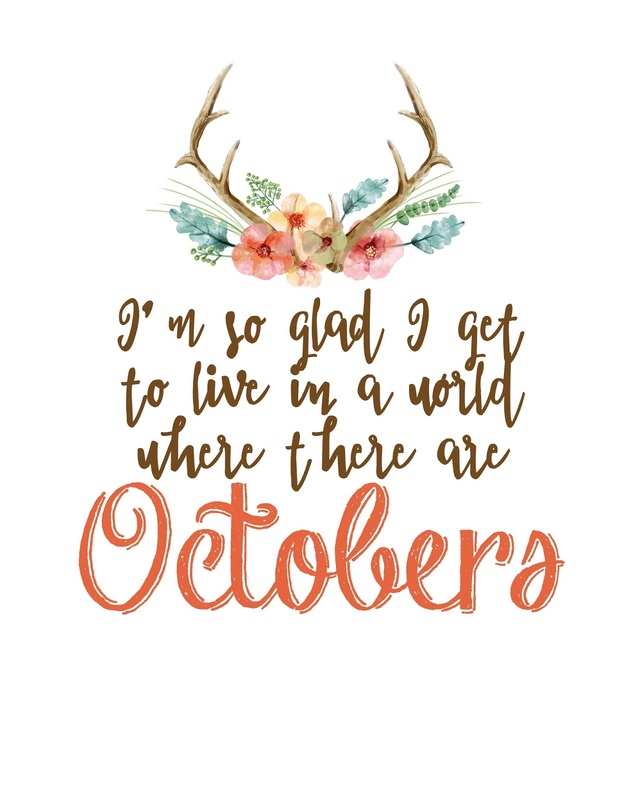 There's just something about October though. The leaves start to change and fall. That breeze. Oh, that breeze. Windows open. At home AND in the car. Radio up. Deer season. October baseball - because....CUBS. Octobers are good for the soul y'all. We took the kids to their first MLB game. It was cold and rainy and they totally weren't feeling it. Best part? We were at a Cardinals game and the kids kept yelling "Go CUBS!". We were like right behind the Cards dugout where all the legit fans sit. LOL. At least we didn't actually put them in their CUBS shirts! The girls painted pumpkins and managed to not make too much of a mess actually. 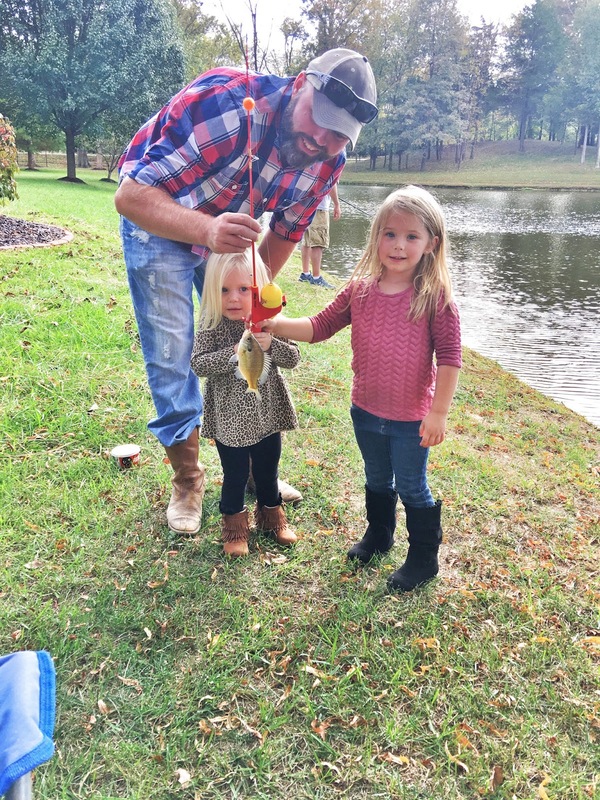 We got to fish at Aunt Lan's during a birthday party. G isn't so sure about those fish! 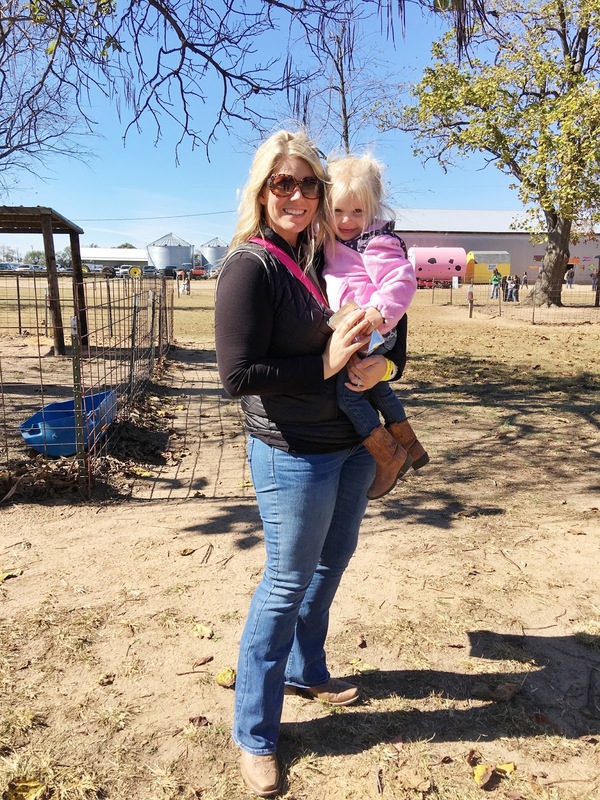 We visited a farm/pumpkin patch with Paisley's class and we also checked out a local farm that put on a big vendor event called "Pickin' at the Patch". The girls loved both! We also survived another September. That month means alot around here. My Dad is in charge of our hometown Apple Festival and of course we're all committee members. It's a family affair. 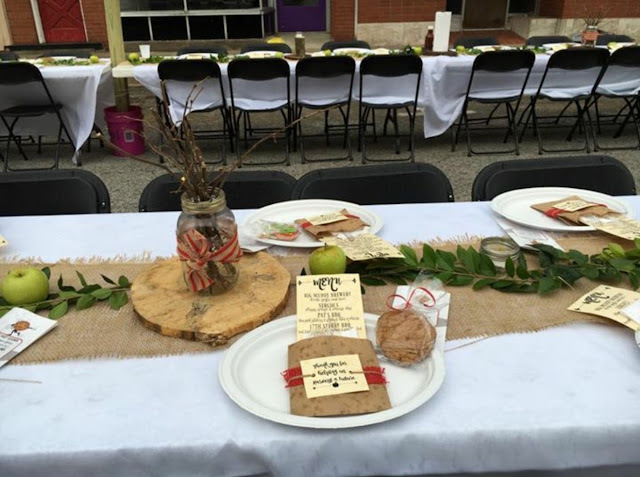 But, this year, Charlie and I put together and pulled off a brand new event (with the help of lots of amazing friends). 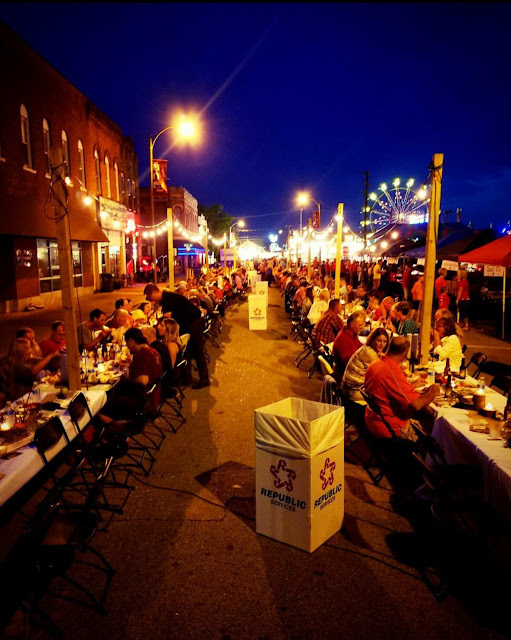 It was called the Taste of Murphysboro and we were able to provide two scholarships to a couple of our hometown kids. It turned out better than expected even though it was an insane amount of work. 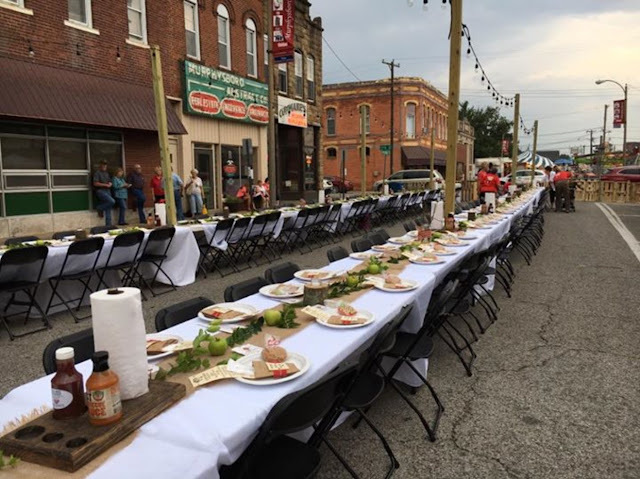 Being able to give back and work in our own little town feels so good. 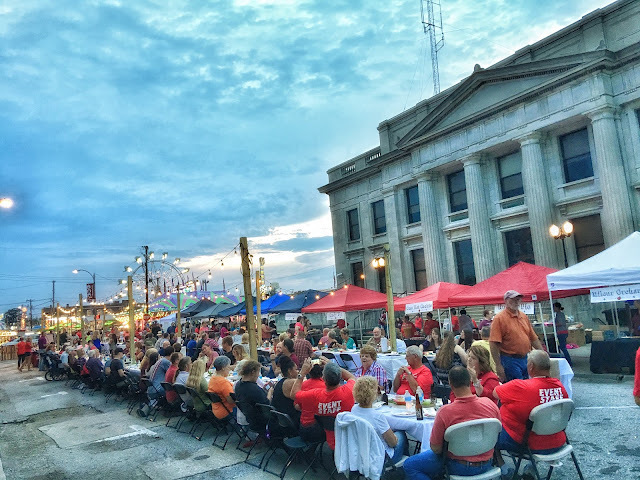 If you're not somehow involved in making your hometown a better place, I sincerely challenge you to get involved. It will make your heart happy. I promise. Well, there it is. 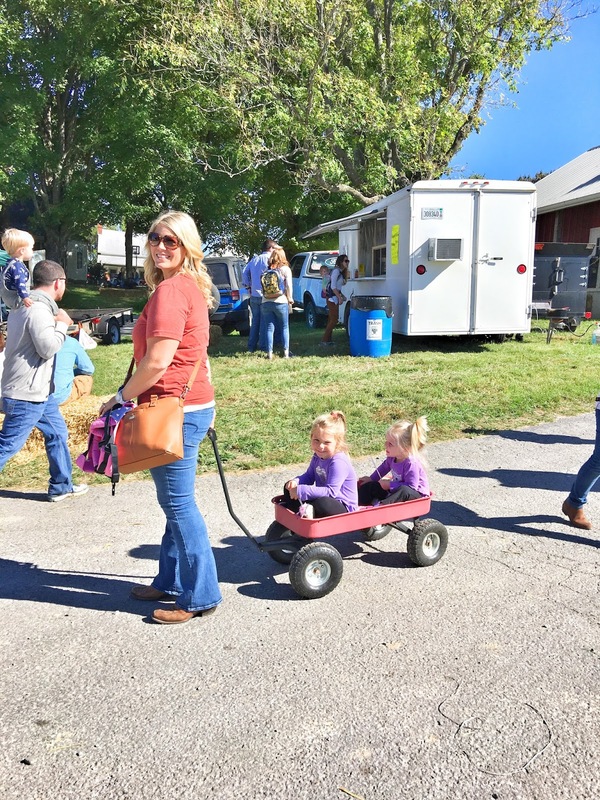 Life lately at the Eisert Farm and a free printable. You know lately I've been trying to take more pictures. I know some people think that today's society is too addicted to their phones and tablets. But I can't imagine not having all of these photo's. 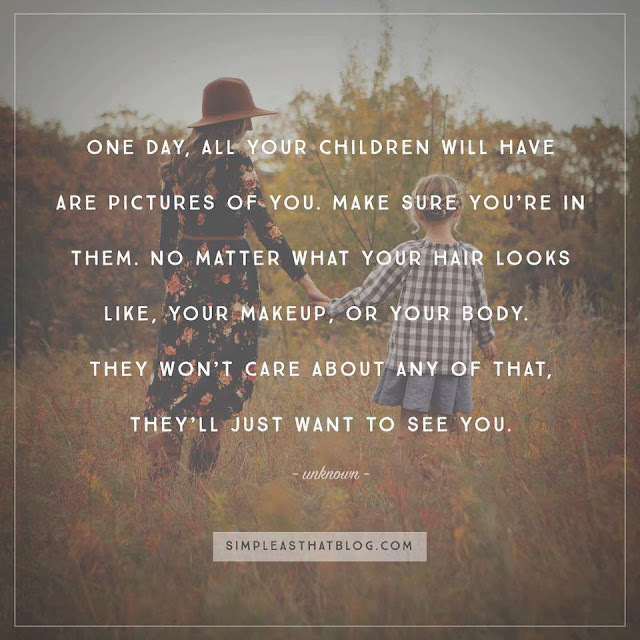 I don't carry around my big ol' fancy camera in my purse and one day....I'll look back and be so, so thankful for these captured memories because y'all, we can't slow down time. And it's flying by. I saw this post on Facebook today and I think it fits perfectly here. Have an awesome day. Thanks for stopping by! Happy Friday!!!!! 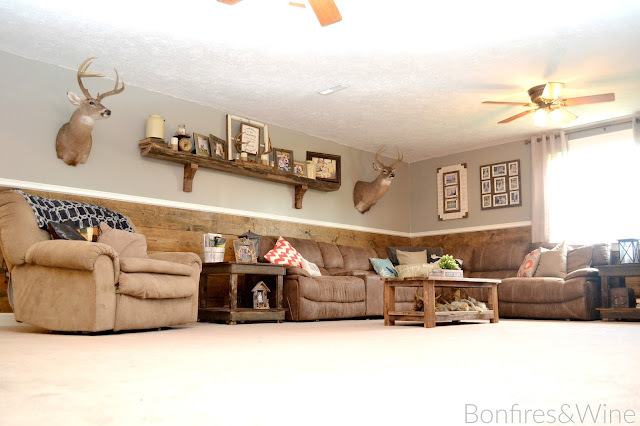 Did you check out our living room remodel yesterday!? Wanna see our kitchen progress!? Check us out - two posts in one week! haha! 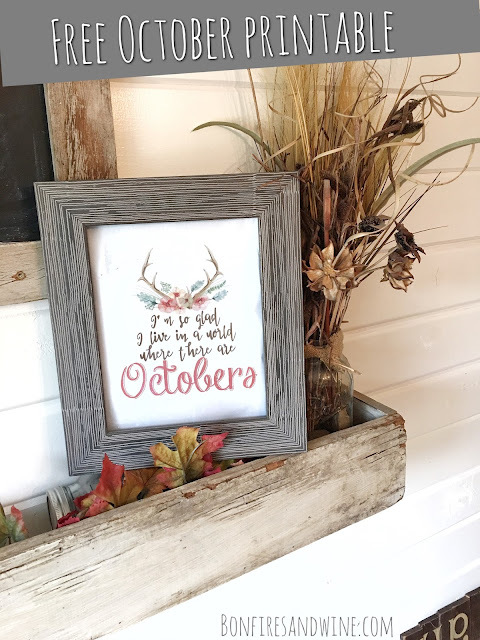 Once we finished the living room, I knew it wouldn't be long and Mama Bear's creative juices would start flowing and she would want to move onto the next project. We had talked about finishing the kitchen for awhile and I knew thats where her focus would be next. 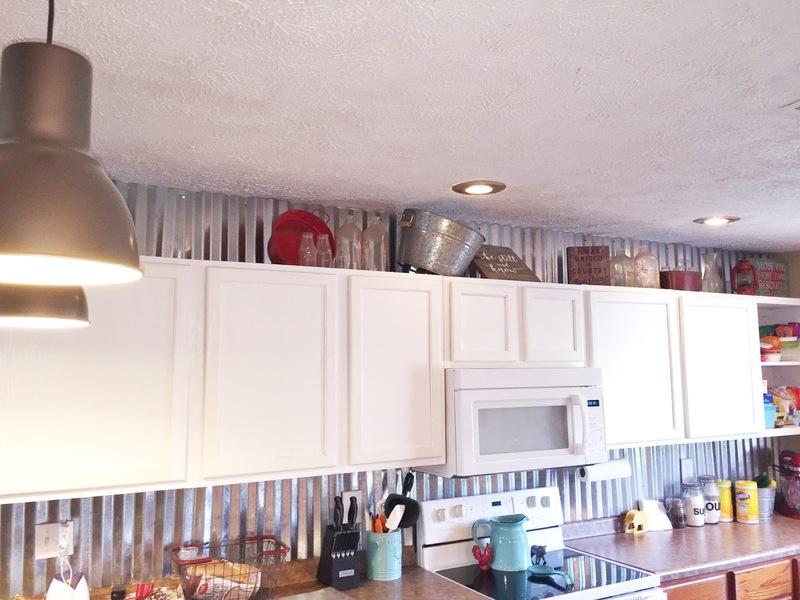 So, I beat her to the punch and said "Why don't we do a shiplap wall in the kitchen?" (I know, asking my wife to do a shiplap wall is like asking a little girl if they want a pony)....and thats where project #2 took life. Some of you might remember the wall we gave a makeover from our diy chalkboard and wine shelf tutorial. If not, you can check it out here. 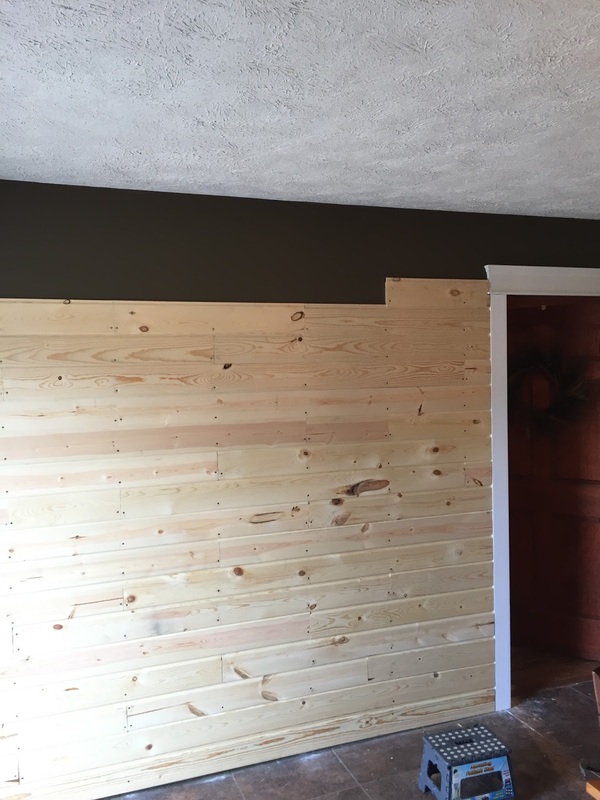 This wall was supposed to be green and somehow when we painted it when building the house the green turned to a brownish color. Disclosure: I forgot to take pictures of the before and each process throughout the project. I know....... Emily made the same face when I told her I forgot. 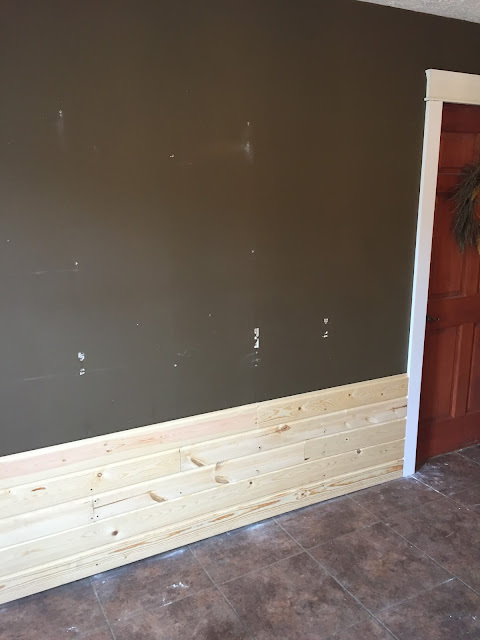 This wall gets treated the roughest out of all the walls in the house. It leads to the outside patio, which the kids, dogs and everyone else are constantly in and out. We always wanted to paint this wall but did not know what color to help hide the beating and dirt and dust it endures. You can see where the chalkboard and wine rack used to sit in this picture. Laying out the shiplap is fairly easy. Make sure to get your bottom row completely level. If your bottom row is off just the littlest bit you will notice it more and more as you go. Be sure to stagger your joints in the wood. My smallest cut was at 16 inches so it will it would hit a stud with each board. Normal interior wall studs are spaced at 16". As with every project I came up a few boards short and had to run to the lumber yard to get some extra material. As we were headed to the checkout Guthrie climbed up on the cart and I snapped this picture on the right. I went back through my pictures and found the picture on the left of Paisley. Both pictures were taken almost exactly 2 years to the date from each other. Apparently Em had me working on a project on that day, too! Not sure if this is coffee or a whiskey drink.......Both are acceptable forms of drink when painting. Just FYI. Here is the finished project. This wall is by far is my favorite in the whole house. We finally got to put our "the farm" sign and our "E" up that we scored at the Nashville Flea Market. This entire room is still a work in progress. Em needs to put some final touches on the wine holder and the bench is going away sometime soon. We'd also like to to refinish our kitchen table. So after we finished the shiplap wall, we decided that our kitchen cabinets needed a major facelift. Being that they are builder grade cabinets they lack character. Again, that gaudy orange plagued our cabinets. I finally was able to talk Emily into buying me a paint sprayer. (A new project means a new tool. I've got this figured out) So now I am in the process of sanding down each cabinet to remove the stain and painting each of our 34 cabinets. So far I've got the top cabinets painted (except the last one on the end.) Theses cabinets got painted twice because the first time I painted them I thought the paint was white which ended up being a light grey. Thank goodness Emily came home and found my mistake. Each day I try to get a couple cabinets sanded and painted so I don't burn myself out from painting. My least favorite thing to do in the world. Stay tuned to check out the finished project in the kitchen. Im sure before its all over Emily will talk me into a farmhouse sink and new countertops. We're also going to try to post more regularly so you can see what we've been up to around here! 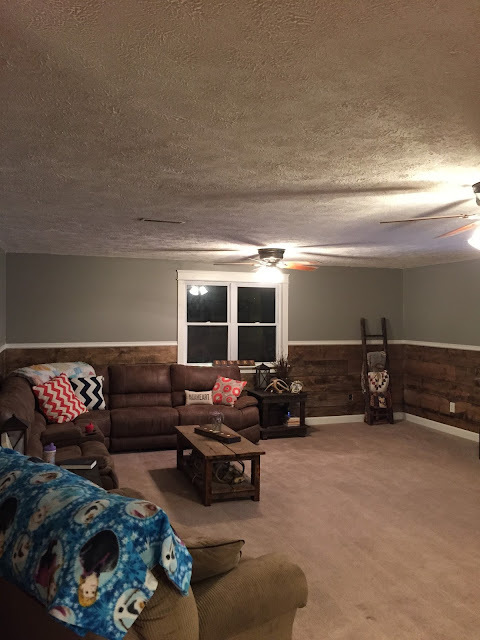 Our Industrial, Farmhouse Living Room Overhaul! Hey, Ya'll....... We've been MIA for a little while now. Not going to beat around the bush here, we've just been busy with life. We just celebrated both Paisley's and Guthrie's birthdays in April. 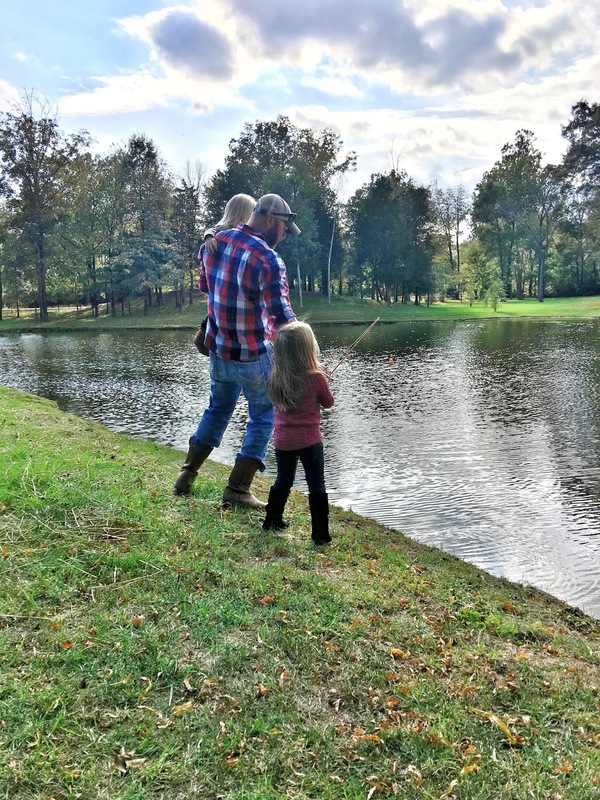 Paisley turned 4 and Guthrie turned 2. (I know......sigh, I can't believe it either.) Now that the girls are getting to that fun, almost self sufficient age, we have been able to do more things with them. Which results in being on the go a lot! Enough with the excuses! ;) Let's talk about some before and after's shall we? When we're not running to toddler tumble classes or to and from pre-school - we've been working on some more home improvements. We originally put the paneling up in the living room when we built the house. After living in the camper for 9 months while building the house, we wanted something that would go up quick, cheap and get us out of the camper and into the house as quickly as possible! So paneling was the answer. Elsa and Frozen to the rescue to keep the kids happy while working! See ya later orange paneling! :) Look how much bigger and brighter it seemed without that gloomy solid orange wall! 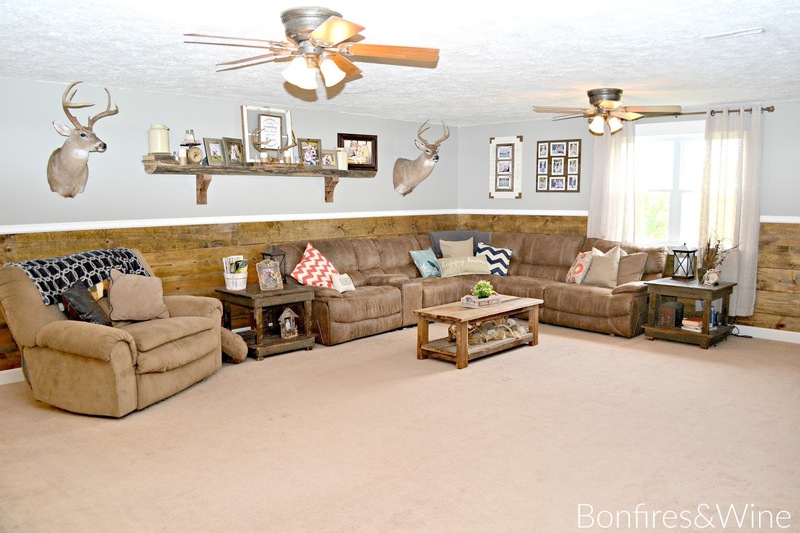 The rest of our house has a farmhouse, industrial, rustic style, so that's what we wanted to go with for this room too. We decided we wanted to drywall the top half and shiplap the bottom half. After hanging the drywall on the top half of the room, we started to install the the bottom boards. We used 1x10 pine boards that we stained in american walnut. We added white accent trim for the baseboard, chair rail and new trim around the window. 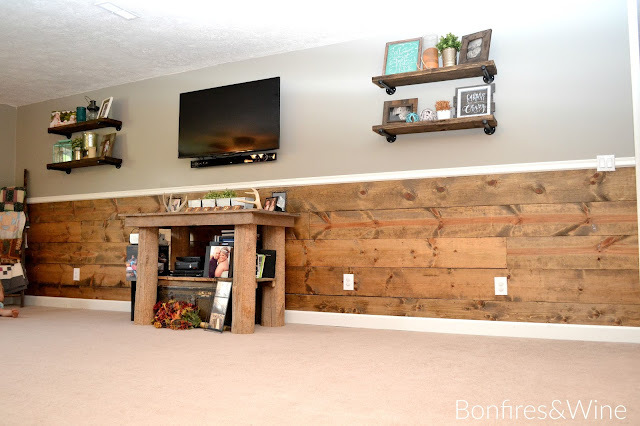 This easy project added so much life to this room! We ended up adding some shelves on the wall with the TV. We wanted to bring in that industrial feel to go with the barn wood furniture we have in the living room. We used galvanized pipe that we painted black and a 2x10 that we stained american walnut to match the wall. And, here's the almost finished project. Of course Em isn't completely satisfied with it yet. She says we need new lamps, new pillows and a new industrial style, long locker style entertainment center. She also mentioned something about those end tables needing to be white. Sounds like I have some more work to do! So stay tuned. I'm sure this room will look different again in a few months! lol! We've also tackled the kitchen. 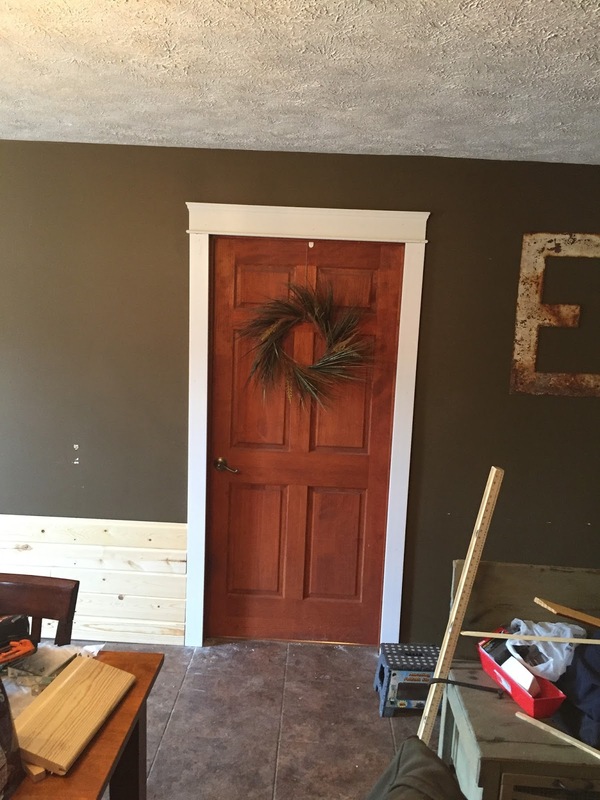 It's looking more farmhouse-ish everyday complete with a white shiplap accent wall. The cabinets are being transitioned to white. New hardware. New decor. Lots of stuff happening in that space! Check back soon for pics of the Farmhouse Kitchen progress! Thanks for stopping by today. Hopefully you'll be able to check in a lot more often from now on!